Last night, I went to the Troubadour to see The Low Anthem. They’re a folk group from Rhode Island. They all play several different instruments, and rotate them throughout the set. The lead singer, Ben Knox Miller, has a voice that will break your heart in a million ways. Jeffrey Prystowsky switches back and forth from the drums to the upright bass to shakers made out of pill bottles and drum sticks. He has this sweet and gentle low voice that warms up their harmonies when they sing all together. Then there’s Jocie Adams, who used to work for NASA (whoa! ), who has this quiet intensity that reels you in. It’s hypnotizing. She plays the clarinet, dulcimer, these neat bells that she bows, bass, guitar, keys, trumpet and probably so much more. Oh, and she totally wails when she sings. So inspiring to watch as a female musician. She makes me really want to get out there and take some risks and hone in on everything that I’m doing. The first experience I had with The Low Anthem was back in May of this year. My friend, Ben White, (and one of my favorite local songwriters), had been talking them up for some time, and we and a bunch of friends all went to see them play at the Gene Autry Museum. I used to go to there when I was a kid. My dad was always into old western movies and would drag the family to the Lone Pine film festival, and to the museum and we’d always dress up. So going back there after so many years was very nostalgic. The concert was pretty magical. It started to rain, and they had to turn off the p.a. and moved all their instruments under the tunnel entrance, and the whole crowd gathered around to hear them play the rest of their set acoustic. The whole experience was really inspiring, so I wrote them a tribute song about that show. I recorded it the other night at my house, rocking a few sm58s, an mbox and audacity. 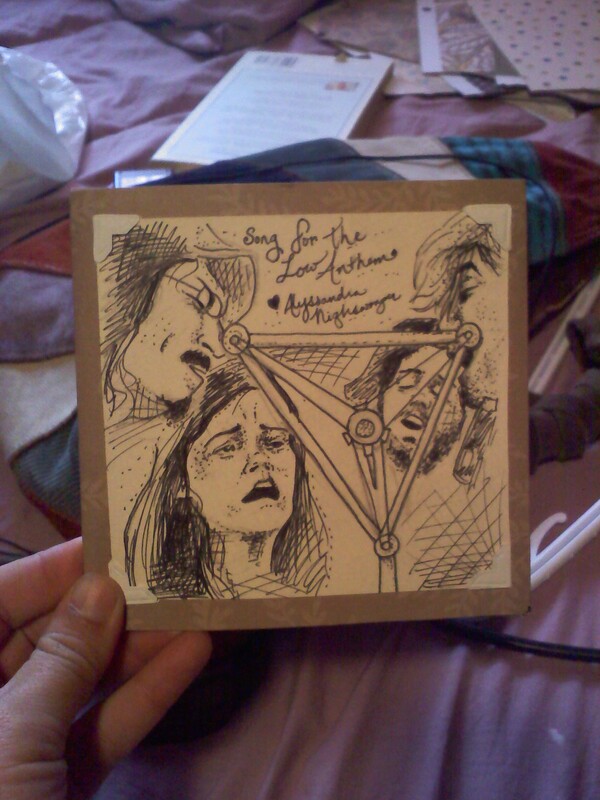 Then I handmade a cdcase out of some scrapbooking paper, and I did a portrait drawing of them to put on the front cover, and wrote a nice note on the back. Here’s the song! Click here to listen! Hope you like it! Then we watched the show and it was everything I hoped it would be. And of course, I ran into Ben White there, too!